It's a bird, it's a plane, it's Captain Airpower! You are at:Home»Air Force»It's a bird, it's a plane, it's Captain Airpower! 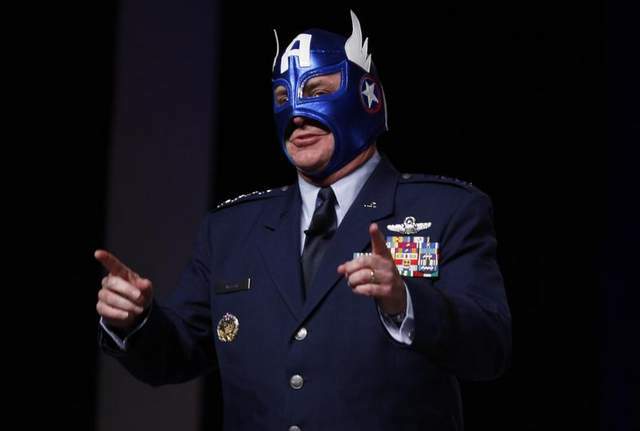 By day, he’s Gen. Mark Welsh, the mild-mannered Air Force chief of staff, but at night he assumes his alter ego: Captain Airpower! Pictures went viral when Welsh first donned his Captain Airpower mask at September’s Air Force Association Air and Space Conference. Not all of the responses were kind. “So, I am supposed to [counsel]airman on respecting their uniform and wear it correctly, but 4 stars are walking around with masks on … got it,” one person posted under the photo on Air Force Times’ Facebook page at the time. At a recent speech to Air Force Academy cadets, Welsh acknowledged that not everyone appreciated his super hero identity. “People thought it was demeaning to the position of the chief of staff and it was beneath me,” he said during his Oct. 28 speech. Welsh did not elaborate on what his plot entails. Captain Airpower is stylized on the comic book character Captain America, who got his start punching Adolf Hitler in the jaw before becoming disillusioned by Watergate and becoming “Nomad.” He later became Captain America again. Don’t ask how. It’s complicated. To date, Captain Airpower is not a member of S.H.I.E.L.D., the Avengers or the Legion of Doom.